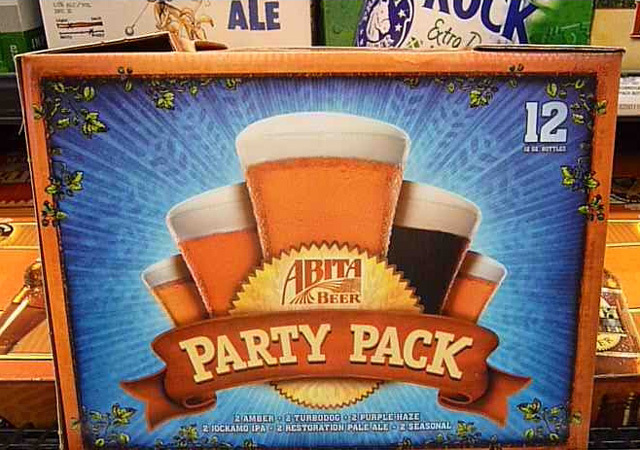 The libation of choice for the Chintzy Chef is of the golden variety: beer, whiskey or scotch. But, on a muggy, hot Global Warmed afternoon in the South, I am not averse to a icy-blended, fluorescent, concoction that's spiked with Everclear 190. In Louisiana (and Texas) there are fast food drive-thru's serving slushy Daiquiris. I don't know how the heck they get away with it. 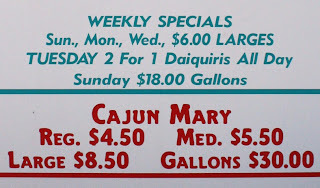 Every time I go back to visit my Mom and Sis, I am reminded about this quirky roadside custom.. And it all comes back when I spy one on the Airline Highway on the way home (having just shot my nephew Zakk's recipe of Blackened Fish With Sweet Potato Fries, click here to see it.) It turns out Mom and Sis are not at all averse to getting cold to-go cups, especially on Tuesday's Special 2-for-1 priced Daiquiris day. 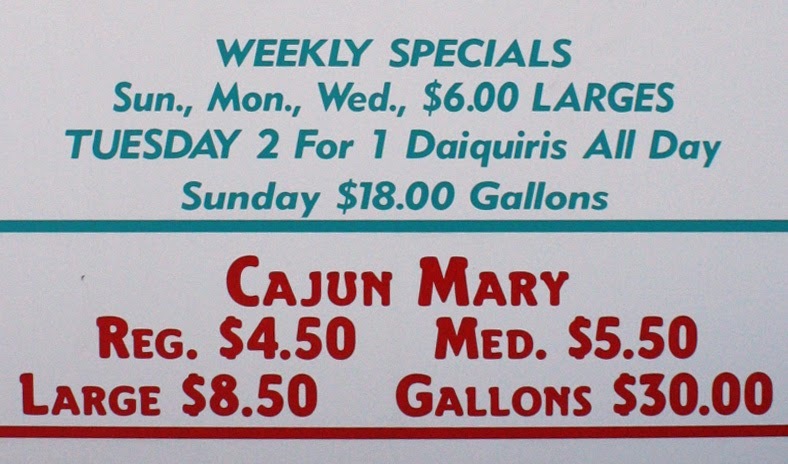 If you've never experienced this, you can hop into the car with The 99 Cent Chef by clicking on my new Cajun Cuisine Diaries video below, where you'll get a backseat view of how it's done. Like any drive-thru, you look at the menu and order through a speaker-box, then pull up to the window to pay. From my vantage point, I spotted at least a dozen faucets embedded in a row of clear plexiglass, holding a colorful rainbow of icy blended flavors. 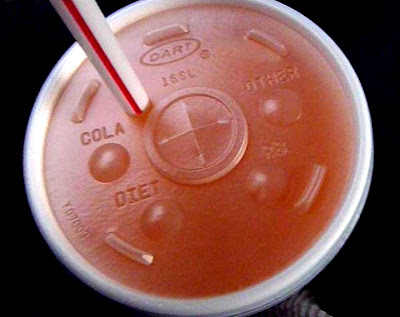 While still behind the wheel, you're handed a large Styrofoam cup with a typical soft drink plastic top, and a straw. Now, there are rules to this. 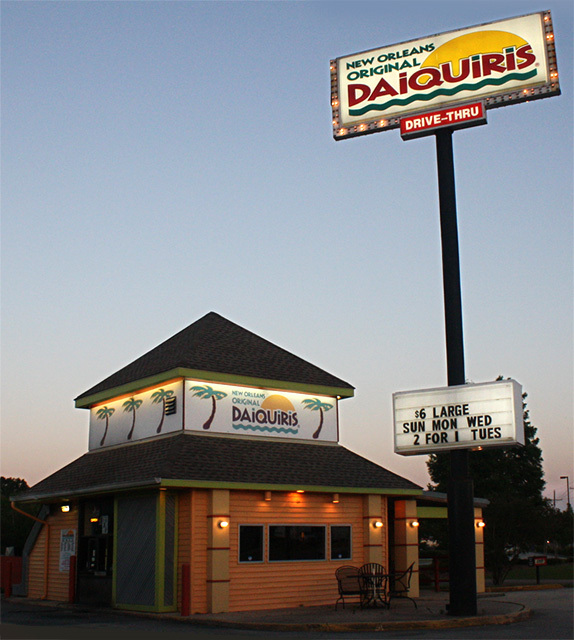 Louisiana has an open container liquor law. 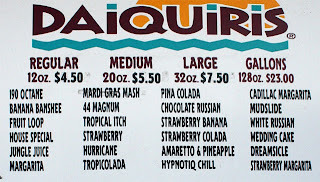 So, when you get your Daiquiri, as both Mom and Sis reminded me several times: "Do not put the straw in!" That is a DUI violation if you are stopped. However parched you are, resist plunging the straw through the drink top -- until you get home. Fortunately, Mom's house was less than 5 minutes away. And a frosty beverage is the perfect way to end a day of filming my Chef Nephews recipes. Thanks for tagging along with me! Play it here. The video runs 1 minute, 32 seconds. 99 thanks to Mom & Brenda -- I love you both! My youngest nephew Zack has cheffed since 17. No culinary school, just the kitchen of cast iron knocks and skillet burns. 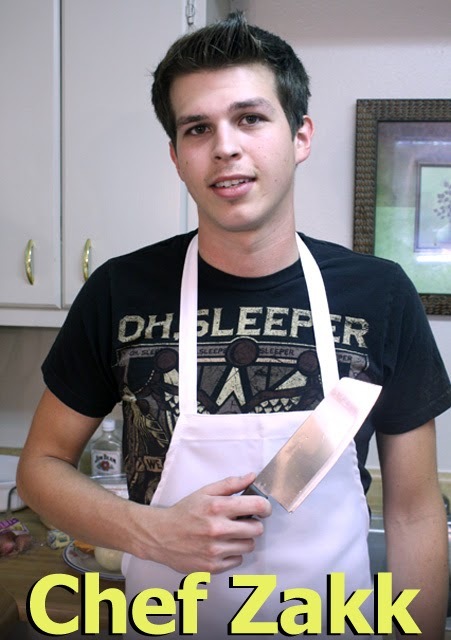 From greasy spoons to polished silver gravy bowls, Chef Zack is working his way through fast food joints and high priced eateries, ever expanding his cooking chops. 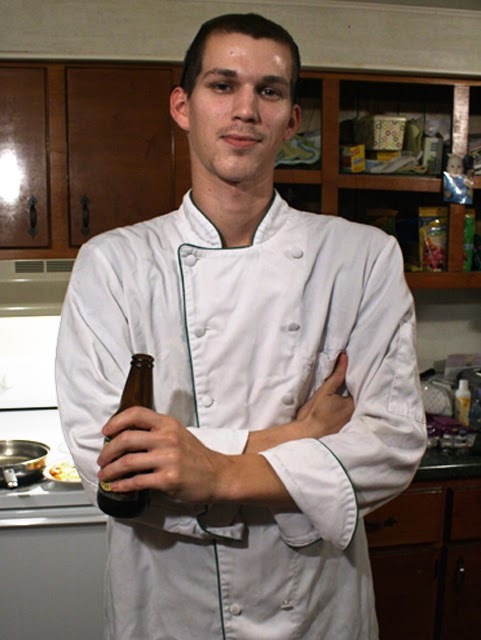 For Uncle 99 Cent Chef, 21 year old Chef Zack pulls out a gourmet entree from his Cajun culinary repertoire: Blackened Fish with Sweet Potato Hash, and topped with a Creole Mustard Beurre Blanc Sauce - that's 3 recipes for this post. Of course, once again the recipes call for a lot of butter -- which is a restaurant's little secret in getting repeat customers! 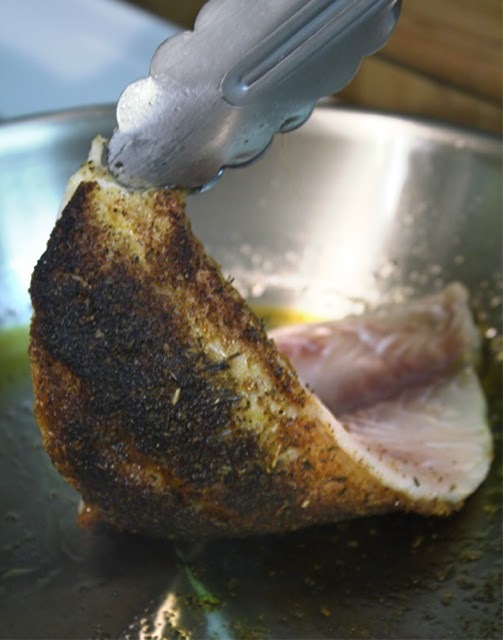 My latest video provides a step-by-step fish blackening technique from this Louisiana chef. Plus, his Mustard Beurre Blanc Sauce, that covers the fish, is killer -- literally so, made with a 1/4 stick of butter and rich whipping cream. Chef Matt would probably sever family ties, but I'll go ahead and recommend you can get away with half the amount of butter, or substitute olive oil. The luscious sauce is sour with mustard, and studded with tiny capers -- but sweet with whipping cream and Chardonnay. The creamy Bernaises compliments, and contrasts, the intense Cajun spices that are charred black, and fused, onto flaky fish fillets. Chopped Applewood Bacon is added to the deliciously decedent Sweet Potoato Hash. The hash is first quick fried in oil, then fried a second time with bacon fat. And just before plating he mixes in sauteed onions and crispy bacon pieces. Sweet and savory, I found myself watching closely while I was filming close-ups. I could definitely see myself serving this again soon, although a lighter version with a lot less bacon fat. And I would use regular bacon, too. I picked up a pound of Applewood Bacon for almost $10 -- never again! Chef Zack blackened a local fish called Redfish, that costs around $8 per pound. For a cheapie version I would substitute three, to four, 4 ounce packages of 99.99 cent firm fish like: Talapia, Rockfish, Cod, Shark, Halibut, or even Salmon. 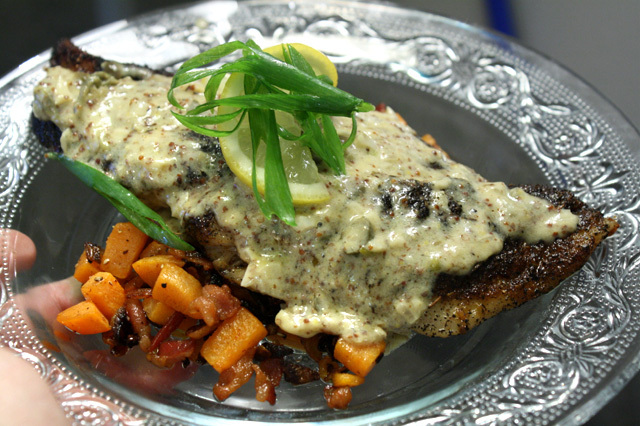 If you have a local catch, then try out Chef Zakk's recipe on it. Other 99c only Store ingredients I've found recently, listed above, are: capers, whipping cream, small bottles of white wine, and grainy, country style Dijon mustard -- which you can use instead of Zakk's recommended Cajun Mustard. 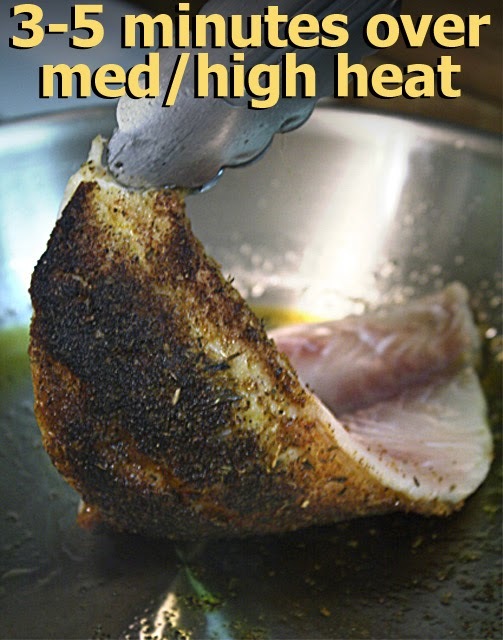 For the Blackened Fish recipe, Chef Zakk uses Chef Paul Prudhommes Blackened Redfish Magic. I've include a Homemade Blackened Spice Mix at the end of this post. It's cheap and easy to do, so don't worry if your local market doesn't carry it -- I've got your back! When you watch the Chintzy Chef's video of nephew Zack, you'll see restaurant cooking skills for chopping, sauteing and garnishing. I added a short how-to bonus video of Chef Zakk creating Sliced Lemon Twist and Curled Green Onion garnishes - at the end of this post. 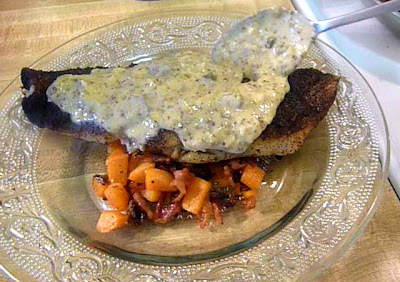 My latest recipe video is a lot of fun, where Chef Zacks' Mom, Granny, and Zakk's roommate, Wesley, all make memorable appearances -- mainly to fork their way into Uncle 99 Cent Chef's plate of Blackened Fish and Sweet Potato Hash, topped with a Creole Mustard Beurre Blanc Sauce! Play it here. The video runs 10 minutes. 99 thanks to Mom, Brenda, Chef Zakk and his roomates. 1 whole sweet potato - peeled and cut into 1/2 inch cubes. 2 cups to water with ice - for chilling cubed sweet potatoes. 1-2 shallots - about 2 tablespoons minced. 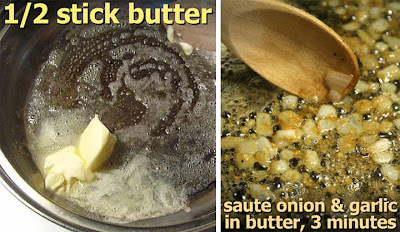 1/4 stick of butter - or 1 tablespoon favorite oil. 1 tablespoon of capers - drained and roughly chopped. 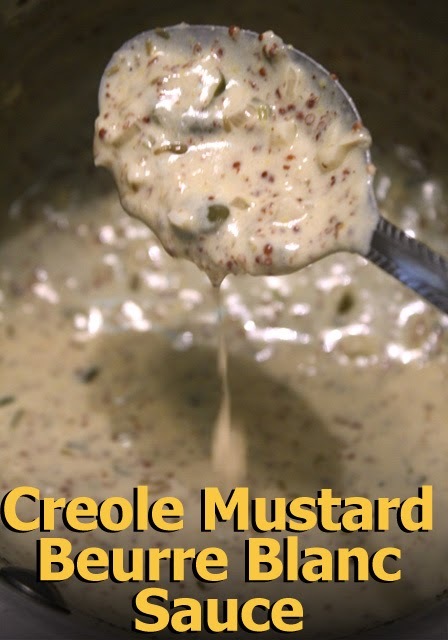 2 tablespoons of Creole Mustard - okay to use grainy country style mustard. 2 fish fillets - any firm fish will do. Chef Zakk used Redfish. 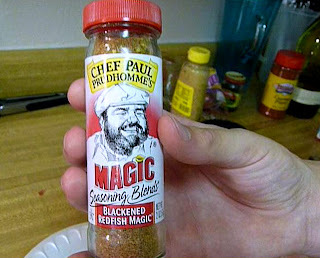 1/4 cup of *Blackened Fish Spice - Chef Zakk uses Chef Paul Prudhommes Blackened Redfish Magic brand. I have an easy homemade recipe at end of post. 2 tablespoons of white wine - for deglazing. Peel and cut sweet potatoes into 1/2 inch cubes. 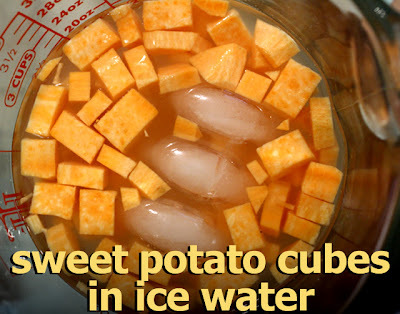 Set aside sweet potatoes into a bowl of iced water. Chop 1/2 package of Applewood Bacon (99 Cent Chef version uses regular bacon,) and add to large saute pan, over medium heat. Cook about 10 minutes until brown and crispy. Reserve bacon grease for cooking onion. While bacon is cooking chop one whole onion. When bacon is browned remove it. 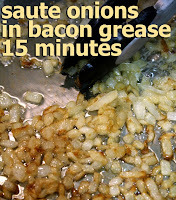 Add chopped onion to about 1/4 cup of the bacon grease. 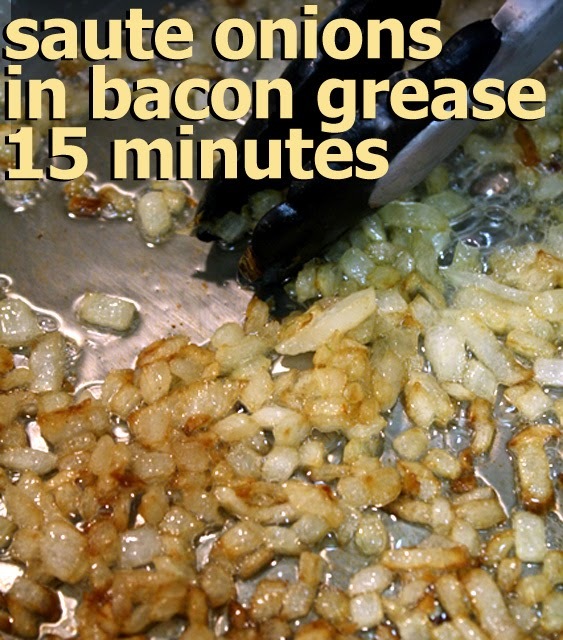 Caramelize onions over a low heat - careful not to burn them, about 15 minutes. When done, set aside. Drain cubed sweet potatoes. In a pot, heat 1/2 cup of veggie oil to a medium/hight heat. Drain sweet potatoes and carefully add to hot oil. 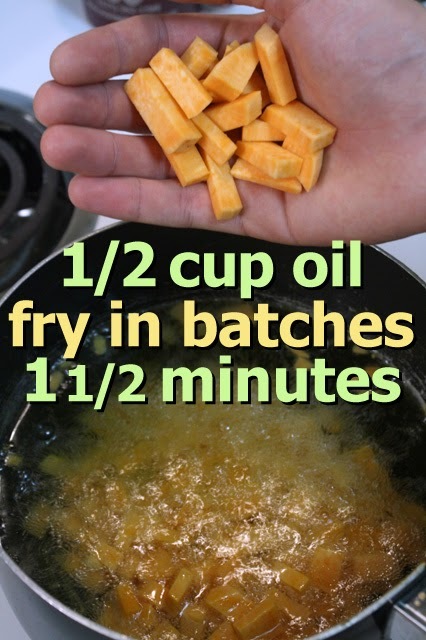 Okay to fry in batches. It's a quick minute and a half fry. You will finish cooking the hash, with onion and bacon, later. Remove and set aside on paper towels to drain. Add butter (or oil) to a pot over medium heat. When butter is melted add white wine. Mince garlic and shallots. Roughly chop drained capers. Add minced shallots, garlic and capers to pot. Salt and pepper to taste. First check fish fillets and remove any bones or any scale pieces. On a plate sprinkle on 1/4 cup of Blackened Fish Spice. Cover plate so fish fillets will get a complete coat. Go to end of post for my Homemade Blackened Mix. Moisten fish with a quick rinse of water, so blackened spices will stick. Take fish fillets and lay onto plate of spice. You only need to well coat one side of each fish fillet. Add one tablespoon of veggie oil to a medium/high heated pan. When oil is hot add fish fillets to pan - spiced side down. Cook 3-5 minutes, depending on thickness of fillet, and heat of frying pan. If fillets are too large then blacken one at a time. When edges of fish start to turn white/grey then lift fish -- the cooked side should be charred brown to black. Flip fillet over. Deglaze pan with 2 tablespoons of white wine. Wine may splatter, so be careful. Shake pan to loosen tasty bits, and put the pan in the oven. 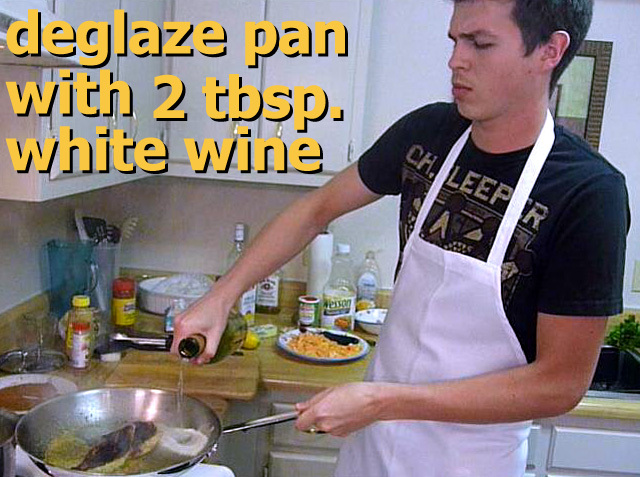 If your saute pan is not ovenproof, then put fish, with wine sauce, into an uncovered, ovenproof dish or pan. It only takes another 5 minutes of baking -- as you bring all the parts together. You can also just leave blackened fish in the pan, over a low heat, on the stove top. Add teaspoon of butter (optional) into warming Beurre Blanc sauce. Mix well. Set aside over low heat. Over medium/high heat add caramelized onion and bacon to a pan. 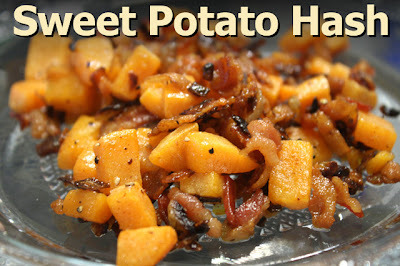 After a couple of minutes, when hot, add sweet potato cubes. Salt and pepper to taste. Mix well and heat through for a minute. 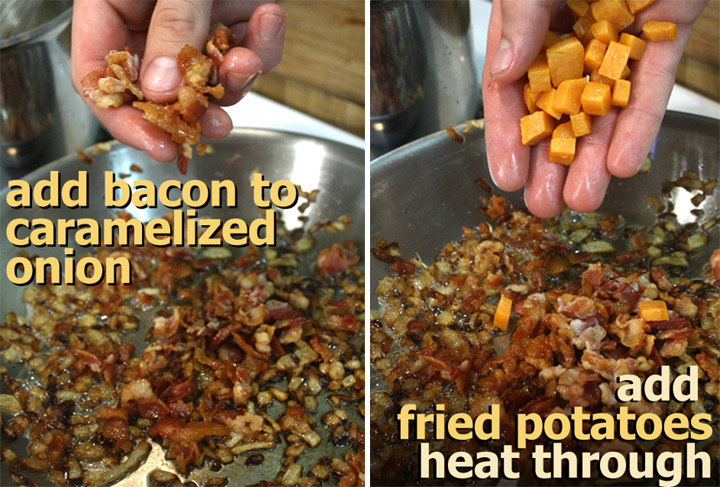 On a plate, add a layer of Sweet Potato Hash. Place fish, blackened side up, on the hash. Finally, spoon over Beurre Blanc Sauce onto fish. Repeat assembly for the second serving. Optional garnishes are sliced lemon, fresh parsley and thin-sliced green onion stems. Check out the short video below to see Chef Zakk's garnish demonstration. Play it here. The video runs 1 minute 22 seconds. *Homemade Blackened Spice is simple to make. If you have a jar of generic Cajun spices, pour out a 1/4 cup, and stir in a teaspoon of dried Italian herbs, like: oregano, basil and thyme. Mix well. 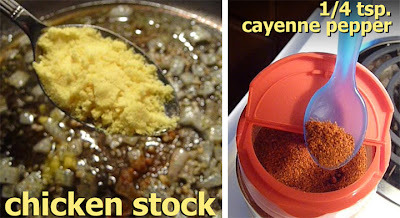 To make a dry Cajun Blackened Spice Blend from scratch: 2 tablespoons each of garlic and onion powder, paprika, black pepper, plus a 1/4 teaspoon of salt and ceyenne pepper. Add teaspoon of dried Italian herbs. Stir until well mixed. For my next video, I give you a "locals only" guide on where to buy fresh caught and cooked crawfish in Louisiana -- plus how to eat one. 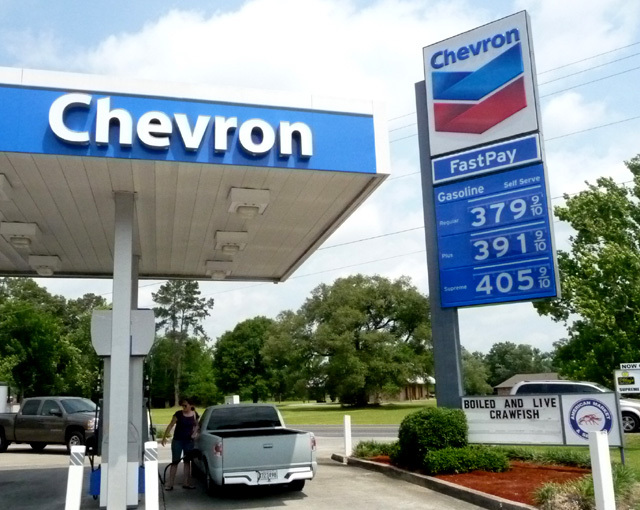 So, be sure to to bookmark this post if you are planning a trip to Cajun country. 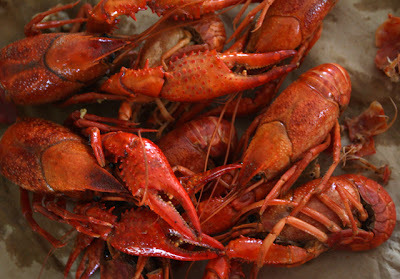 Crawfish are sometimes referred to as "mudbugs." 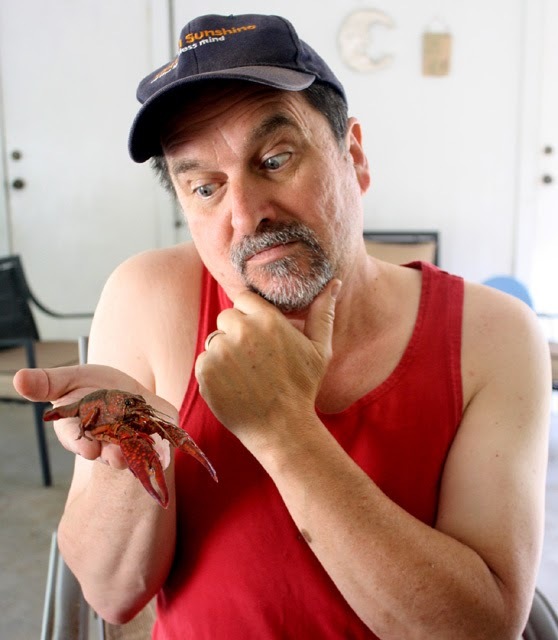 As a teenager in Gonzales, Louisiana, I accompanied a high school friend on a crawfish-trapping expedition deep in a cypress tree shrouded swamp. We waded through knee-deep water to set out the baited traps, while on the lookout for snakes and alligators (even for a Cajun, the swamp is dangerous territory). A short while later we circled back to pluck dozens of claw-snapping crustaceans from the traps, carefully scooping them into gunny sacks. It was hard work, sloshing around while swatting at dive-bombing mosquitoes, but the reward was so tasty - a freshwater crawdad has the same texture as a shrimp, with a lesser, but still delicate seafood flavor. Crawfish are prepared in a spicy crab boil. The meat is peeled from the tail, and is tiny like bay shrimp. 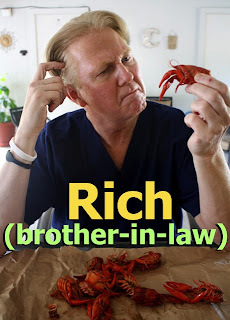 At the height of the season (May and June) you can easily buy whole crawfish for close to 99 cents per pound, uncooked (add a couple of dollars for cooked.) For a typical amount of whole crawfish per person, you want to start with five pounds. Locals buy them by the bagful from gas stations, which often have a deli in the back of their convenience stores stocked with locally caught shrimp and crawfish. 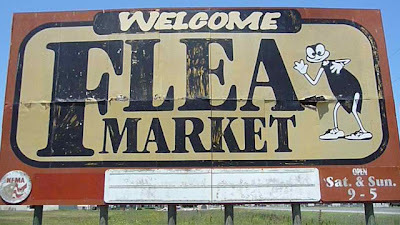 This is where you get it the cheapest and freshest. Usually around 4 p.m. (when refinery workers are just getting off their shifts) fresh boiled crawfish are ready to eat there, or take home. Just watch my video to see for yourself -- I even take you into the back to see the cooking setup. In towns everywhere, from New Orleans to Shreveport, crawfish season is celebrated with backyard parties, centered around crawfish boiling over a large butane-fired kettle. Along with the crawfish, potatoes and fresh corn are boiled together in a spicy broth, then heaped onto newspaper-lined picnic tables. With a keg in the corner and music in the background -- these parties are a great Spring and Summer outdoor tradition. 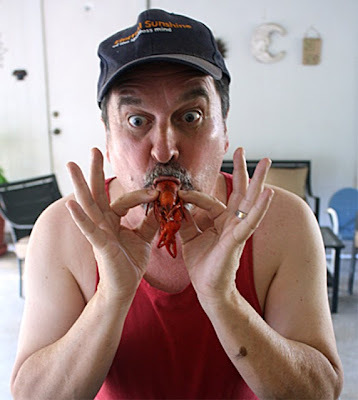 In this video, I've included a tutorial on how to eat a crawfish. When you're at a picnic table and a kettle of hot steaming crawfish is dumped in a pile in front of you, you better know how to quickly peel and eat, or you'll be picking through discarded empty shells. A hungry Cajun can go through a pile before finishing an Abita beer! Click on the video below to see how it's done. In Cajun country rather than eat 'head to tail' as they say in foodie circles, we eat "tail to head" -- literally. 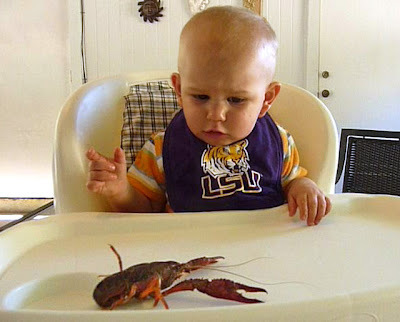 A real Cajun will finish off each crawfish with a head-sucking flourish. The spicy/sweet watery roe is addicting, once you get over typical tourist apprehension. 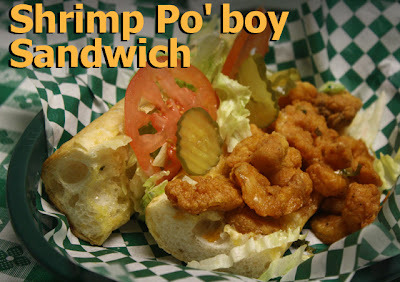 Warning - the squeamish may have to avert their eyes because The Cajun 99 Cent Chef goes all the way! Play it here. The video runs 2 minutes, 12 seconds. 99 thanks to Rich and Brenda. Sharing its Southern border with the Gulf Coast, Louisiana is all about seafood. 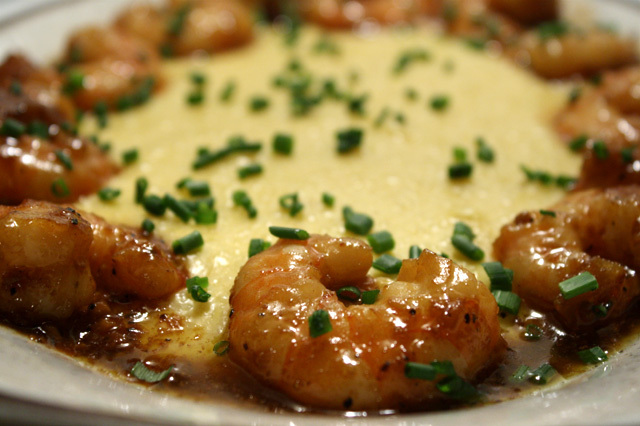 And New Orleans style Shrimp & Cheese Grits is a quick way to get some in a delicious regional specialty! See how it's made in my recipe video, the second one I've posted in a full month of spicy Southern Cajun cooking. 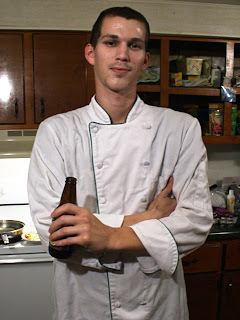 My nephew, 24-year-old Chef Matt Keene, is the first of my sister Brenda's two boys (Brenda is featured in last week's Gumbo video recipe, click here.) 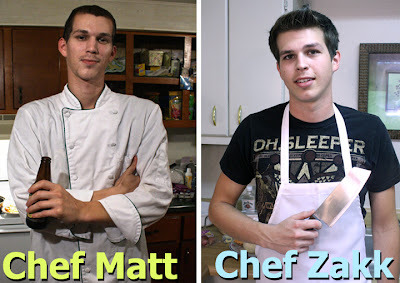 Both young men are accomplished cooks -- I guess it runs in the family! Matt's brother, Chef Zakk, cooks up a Blackened Fish & Sweet Potato Hash in a video I'll post in a couple of weeks, so check for that back here. 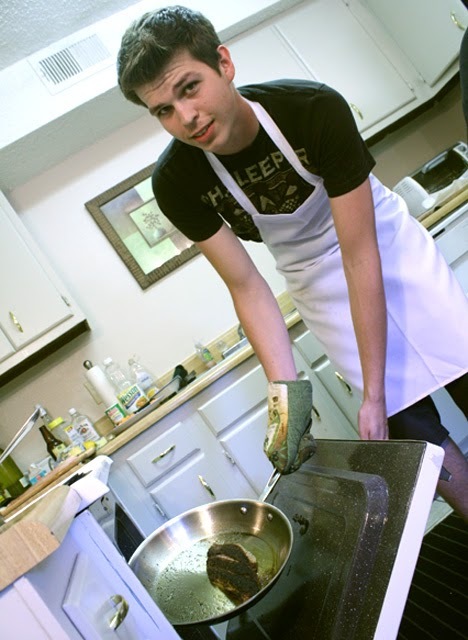 My nephew Matt has experienced seven years behind the grill since he started out flipping burgers while in high school. He currently chefs at the exclusive Country Club of Louisiana in Baton Rouge. Shrimp & Cheese Grits is based on one of that restaurant's recipes, and Chef Matt is skillful enough to simplify it here without sacrificing flavor. The Country Club uses gouda in Cheese Grits, Matt substitutes cheddar cheese. As for grits, he had instant on hand. Of course, you can use regular, longer-cooking grits -- they're certainly cheap enough. Grits are made from ground corn, and similar to Polenta or Cream of Wheat -- smooth with a neutral, mild cornmeal flavor. Typically it is there to soak up a breakfast egg yoke, but Southerners are known to eat it any time of day. Since I'm on vacation, I'll let the Louisiana chefs use their preferred local produce and protein. But I'll add some lower-cost ideas here and there, such as this: If I were to do this recipe cheaply back home, I would use a couple of 4-ounce packages of frozen bay shrimp, purchased for a buck each from a dollar store, or my local Albertsons Market. 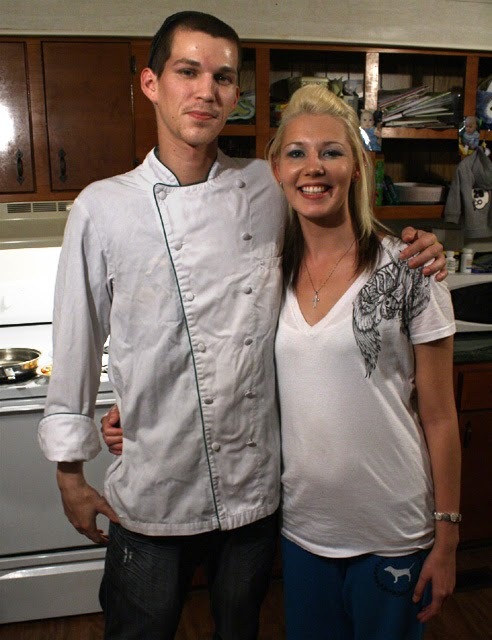 My nephew Matt and his girlfriend Lacee were kind enough to invite Uncle 99 Cent Chef into their roomy trailer kitchen to cook up this yummy Cajun classic. 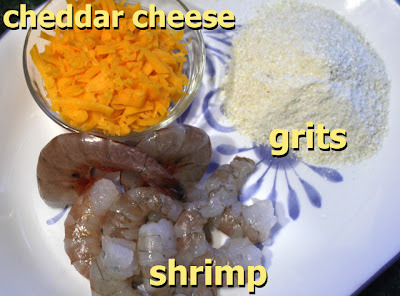 I've always wanted to learn how to make Shrimp & Cheese Grits, and Matt has it down pat. After going through most of the 12'er, Matt thought Abita Amber would be best, as it wouldn't overpower his shrimp and butter sauce. I couldn't agree more. I think I could get away with substituting my local cheapie favorite, Miller High Life, for a 99 cent version -- or if you have a favorite brew, try it. As for cheese, cheddar is cheap, but you could make it with gouda if you wanted to get extravagant. 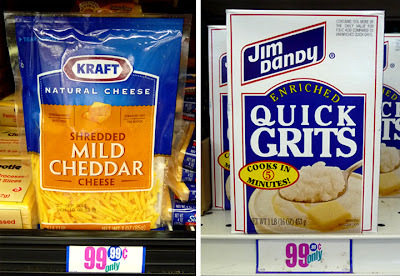 When the grits are hot, both types of cheese blend well - it's a deliciously creamy combination. I could have eaten a dish of Chef Matt's cheesy grits just by itself. 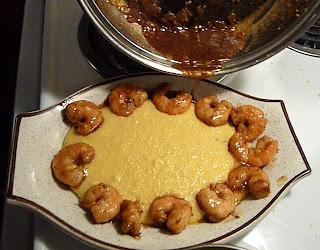 So, plan to give my Cajun nephew's Shrimp & Cheese Grits recipe a try sometime. In the meanwhile, sit back and watch this video demonstration to see how this young buck does it! Play it here. The video runs 7 minutes, 8 seconds. View or embed from youtube, click here. 99 thanks to Chef Matt, Lacee & Miles. 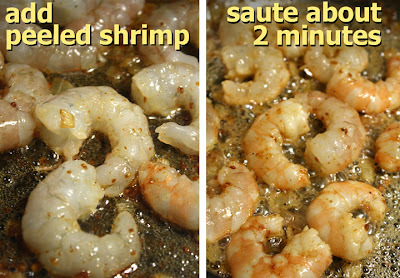 12 shrimp (about 1/2 pound)- medium or large. Okay to use 1/2 pound of cheaper small bay shrimp. 1/2 cup of favorite beer - okay to substitute veggie or chicken stock. 1 tablespoon of chopped chives - or any favorite fresh colorful garnish, like parsley, optional. 1/4 teaspoon lemon pepper - or pepper with tsp. of lemon juice. 1/4 teaspoon cayenne pepper - or to preferred heat level. 1 teaspoon dried chicken stock - or 1 crushed bouillon cube. Okay to use 1/4 cup of liquid chicken stock, too -- if adding liquid, you may need to add a couple of extra minutes of cooking time to reduce sauce. 1/2 stick butter* - and an optional extra pat for Cheese Grits. 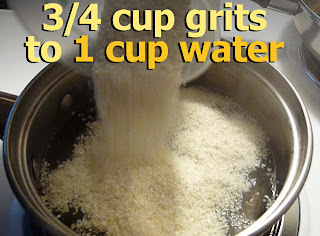 2/3 cup of Grits - instant or regular. 1/2 cup of cheddar cheese - shredded. 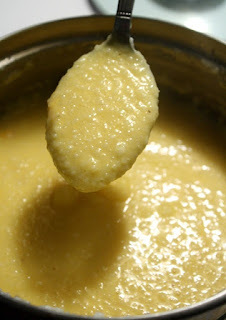 Okay to use small chunks, just make sure to blend well to melt when adding to hot grits. 1 cup of water - for grits. Chop onion and garlic. Melt 1/2 stick of butter in a medium hot pan. Saute veggies about 3 minutes until soft. Add spices and flavorings, including: Liquid Smoke, lemon pepper, cayenne pepper and chicken stock (dried, liquid or bouillon cube). Stir and mix well with sauteing veggies. Time to get the grits going. Add 2/3 cup of grits to 1 cup of boiling water. Depending on your choice of Instant or Regular Grits, double check box directions for cooking times, and per serving amounts. This recipe is for 2 servings. You should taste grits before plating to make sure they are soft, not gritty. Turn heat to low on pot of grits, cover and cook until half done, about 3 minutes. Add 1/2 cup of shredded cheddar cheese. Stir until all cheese is melted and grits turn light orange color. Cover and set aside over lowest heat. 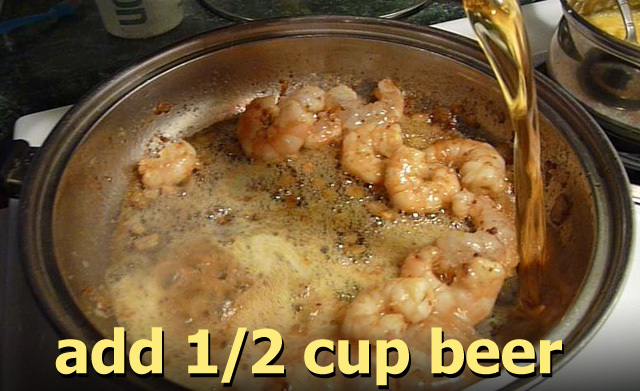 De-glaze pan with 1/2 cup of your favorite beer. Stir and mix well. 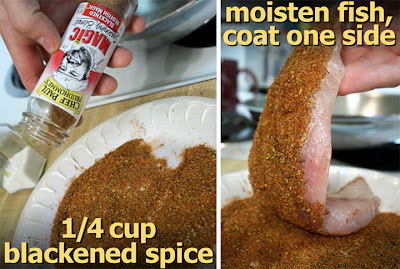 Add Cajun Seasoning with salt and pepper - to taste. If shrimp are precooked, then add them at this time. Check on Cheese Grits and give a final stir. 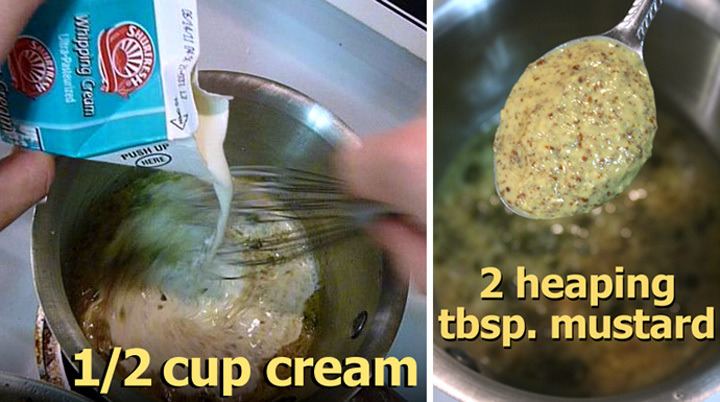 Adding a pat of butter (or butter flavoring) is optional. *Instead of 1/2 stick of butter, you can keep it light by substituting a tablespoon of olive oil. And add a little more beer and chicken (or veggie) stock if you like a lot of sauce. 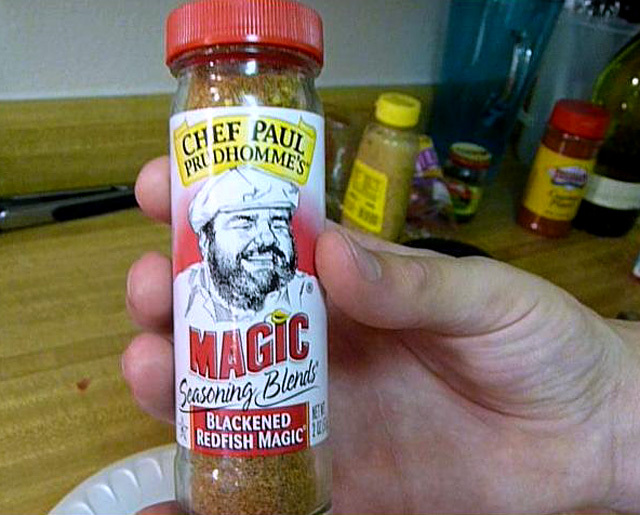 Also, Chef Matt uses many spices and flavorings. If you don't have Liquid Smoke, Lemon Pepper or Cajun Seasonings, don't worry about it -- I'm sure it will be tasty nonetheless. It's a gastronomic family affair all this July. 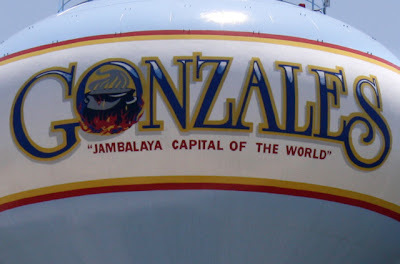 What started with a trip to Gonzales, Louisiana for a visit with Mom, soon turned into a Cajun cooking blow-out! 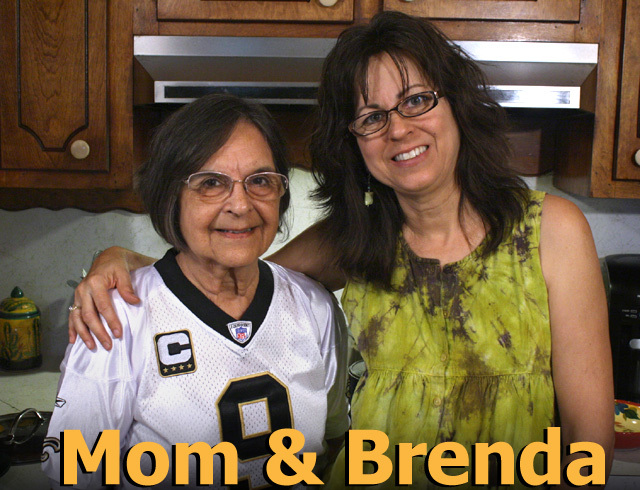 And first up are two videos: Flea Market Food and Mom's Chicken and Sausage Gumbo. It seems almost every relative I ran into works in the food business. From my two nephews, Chef Matt and Chef Zakk, to my nieces' boyfriend, Chef Tony, of BBQGUYS.com. And my Mom makes a mean Chicken and Sausage Gumbo, too. That's four recipes videos right there -- and that's only the half of it! The trip was a walk down my culinary memory lane -- every time I go back I dive right into the local food culture, and this time I'm bringing you along for a flavorful tour! I made a Jambalaya pot full of food videos, everything from How to Eat a Crawfish, and a New Orleans Po' boy Sandwich Tour; to my nephews' recipes for Blackened Redfish with Sweet Potato Hash and Shrimp and Grits. 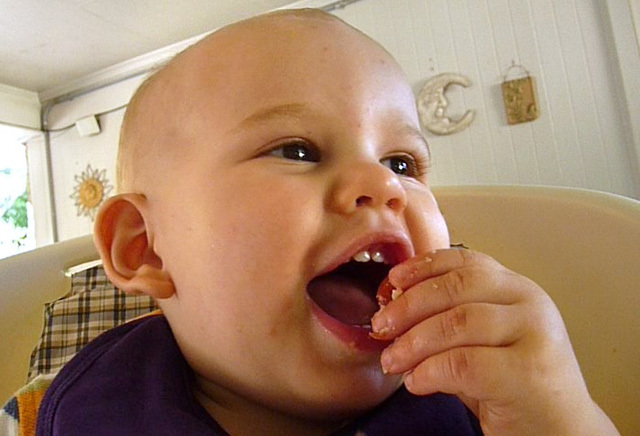 There's also a special a video of my youngest relative, one-year-old Miles. He stars in Miles' First Cajun Bite -- and he's so maddeningly cute. 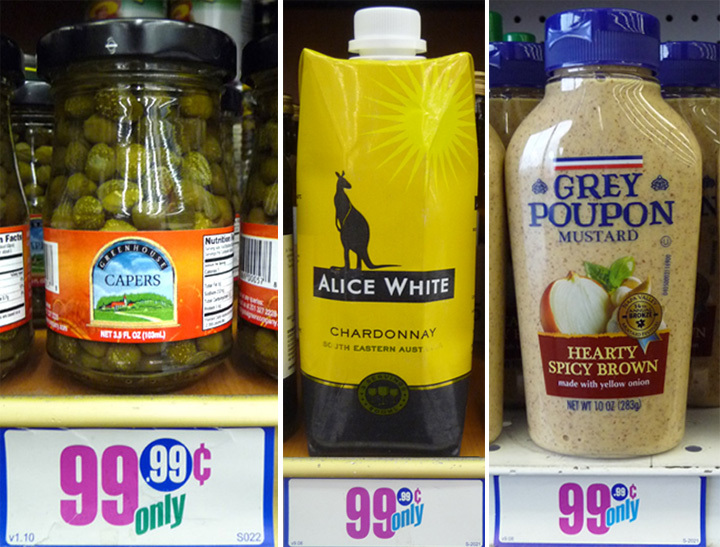 Since this is a vacation, I'm leaving my 99-cent boundaries behind. However, you can't really take the skinflint out of this Chintzy Chef - I'll be showing you plenty of great regional food deals. As for the recipes cooked up by my kinfolk, I'll be giving you tips on using cheaper alternative ingredients. 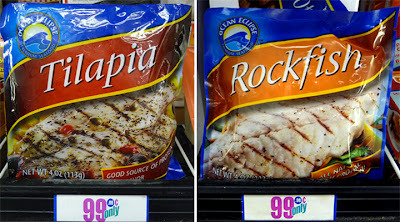 Take the expensive Redfish in my nephew Chef Zakk's Blackened Fish recipe video -- he might flip his chef's hat, but I would cook a cheapie version using a 99.99 cent frozen package of Tilapia fish. You can take the ingredient lists for each recipe with a grain of salt -- if there is a cheaper way, I'll point it out to you. 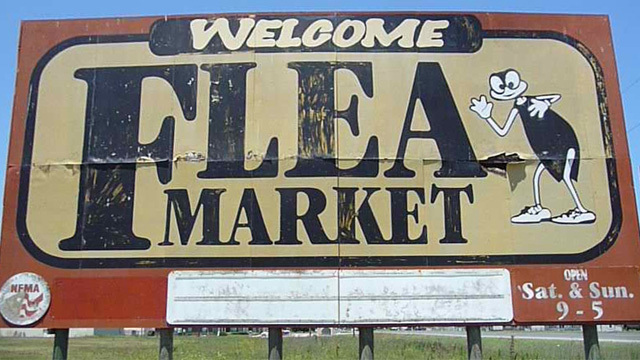 In my first video, below, you'll discover that the local Flea Market is a great place to sample Cajun cuisine on the cheap. 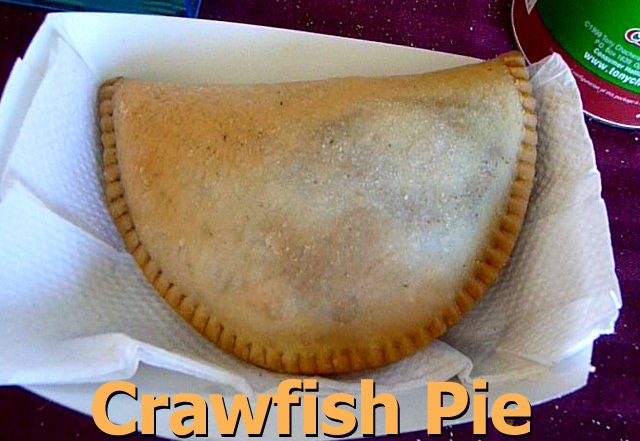 When my brother-in-law Rich let me tag along on his shopping trip, I found out there was a food court selling Crawfish Pie, Jambalaya and Boudin Balls (insert joke here, or just watch the video). You will get a good look at these unusual local delicacies. Crawfish Pie is a flaky turnover with a rich étouffée tomato sauce, stuffed with rice, veggies and plump crawfish tail meat. The Jambalaya is bound to be tasty at this flea market, since it's located just outside of Gonzales, Louisiana, which is known as the Jambalaya Capital of the World (Mom's recipe here.) 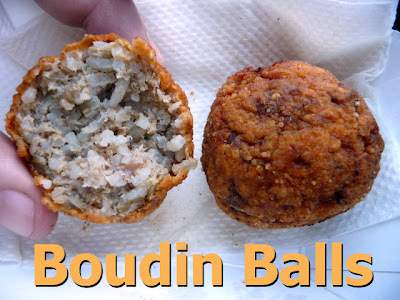 As for Boudin (pronounced boo-dan) Balls, well, watch and learn. Play it here. The video runs 3 minutes, 6 seconds. To view or embed from youtube, click here. And 99 thanks to my brother-in-law Rich! Mom is back for another Cajun classic! It has been too long since I've had her in front of the camera. 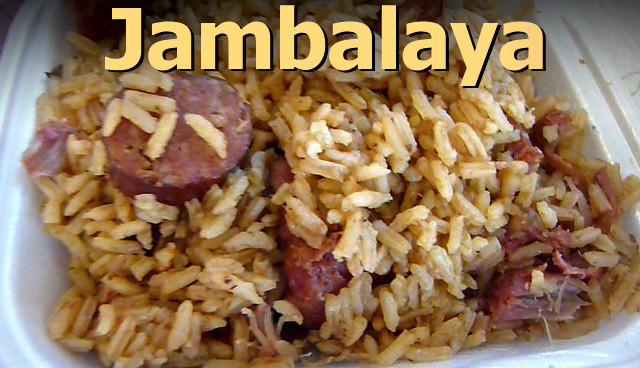 Last time, she rocked the cast iron kettle with a scrumptious rice dish, Mom's Jambalaya (click here) -- it's become one of my Top Ten YouTube videos. 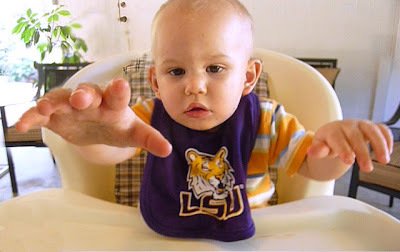 After you see Mom's latest video, for her Louisiana Gumbo, I predict it will be your new favorite. 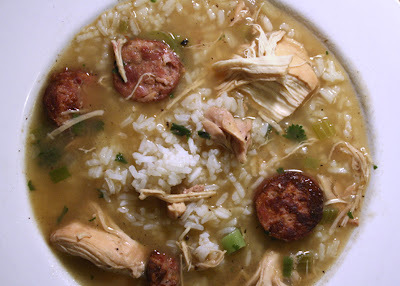 Mom's Chicken and Sausage Gumbo is a perfect budget 99 Cent Chef recipe. Chicken is cheap and sausage is too. Go with your locally made sausage and make the recipe your own. As a side note, a Cajun post-Thanksgiving tradition is to make a Gumbo with leftover cooked turkey. So if you do this version, subtract the raw chicken cooking time (about an hour) - all you are doing is heating up the leftover turkey. 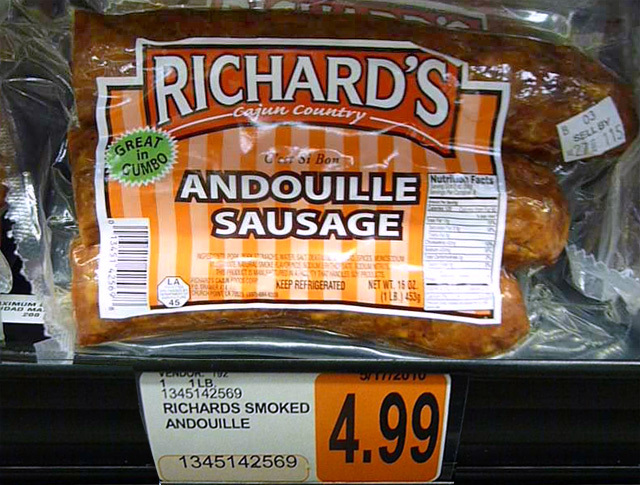 Mom used the more expensive Andouille sausage. Louisiana is famous for this extra lean cured pork link. It holds up to the hour and a half of simmering in a complex dark brown Roux broth. If you use a cheaper sausage, after browning, you may want to add it during the last half hour of cooking. To keep the Gumbo lean and mean, leave off the skin and use white meat only. Although, I prefer dark meat, and usually leave the skin on half of the pieces for a richer broth. Mom used a whole chicken for her recipe with a pound of Andouille sausage. You will need patience: this Cajun soup is slow cooking. But, Mom makes enough for 6-8 servings -- you could feed a party using her recipe. Plus the longer it sits, the deeper the flavor becomes. 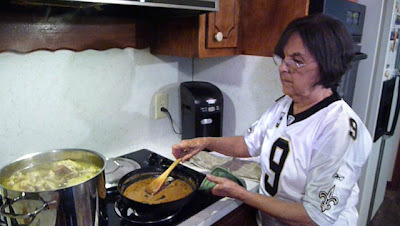 The base of Mom's Gumbo is flour cooked with oil to a dark to medium brown -- it's called a Roux. This is where you have to stand over a skillet and slowly stir for 20 to 30 minutes (depending on the conductivity of the pan). You cannot set a timer to tell you when a Roux is ready -- you have to go by the chocolate color. These days you can take the work out of a Gumbo by buying a pre-made roux sold at some grocery stores. It is already browned and is ready to use. I've seen it sold dry and wet. This Cajun classic uses the so-called local Trinity: chopped bell pepper, onion, and celery. 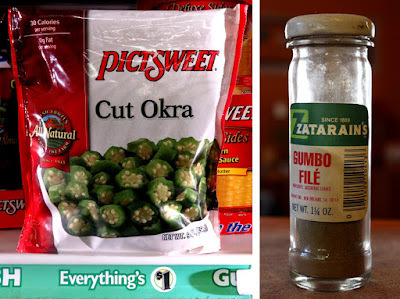 These three inexpensive veggies are used in almost every Louisiana dish. Gumbo can also be made with seafood. If you make a fish, crab, shrimp or crawfish gumbo (or combination), add a teaspoon of crab boil. To enhance the seafood flavor even more, use the broth of boiled seafood shells, and/or the liquid from a small can of cooked oyster pieces or clams. Also - be sure to wait until the last 20 minutes of cooking to add seafood to the gumbo - you don't want to overcook it. To add okra or to not add okra, that is the slimy question. Some are grossed out by okra, but as a thickening agent it's perfect. I like it though, especially coated in cornmeal and fried. The taste if fine with me and goes good in a Gumbo. Of course you can add it or leave it out. 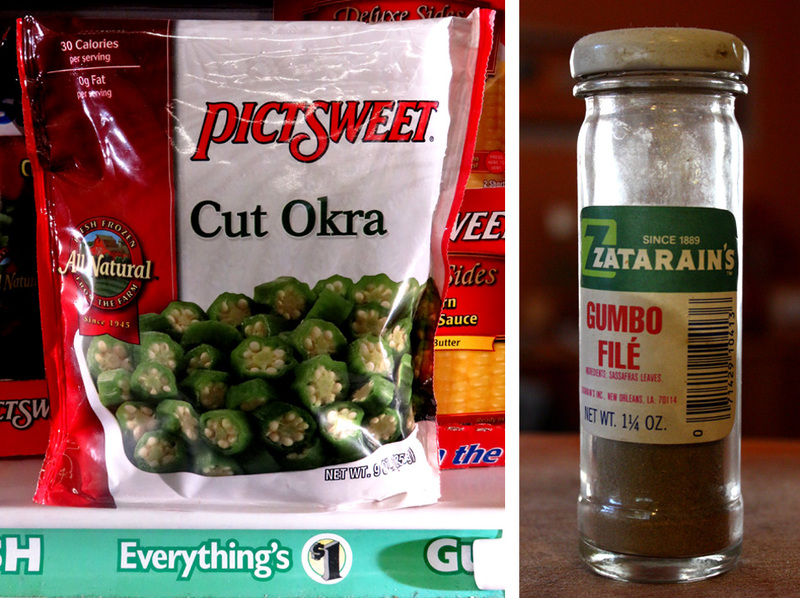 Click here to read about the origins of Gumbo with Okra. File is another spice you add or leave out. It can be hard to find, but it adds another level of flavor to a Gumbo stew. File is made from sassafras leaves, kind of a bay leave flavor. It was originally used to thicken Gumbo. Mom is well known for her Chicken and Sausage Gumbo, and out-of-town family and friends beg her for it! Now the begging is over. Thanks Mom, for sharing your recipe with my visitors and me. I love you. Play it here. The video runs 8 minutes, 8 seconds. To view or embed fromYouTube, click here. 99 thanks to my sister Brenda for comic (and dramatic) relief. 1 whole chicken cut up (about 3-4 lbs. )- okay to use precut packaged pieces. I remove half of the skin for a lighter Gumbo. 1 lb. 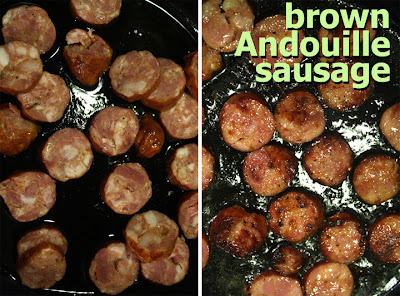 Andouille Sausage sliced - okay to substitute a cheaper favorite. 4 quarts of water - enough water for a soup. 1/2 cup chopped parsley - okay to use tablespoon of dried. 1 teaspoon File (dried sassafras leaves)- optional. Mom didn't use it, but I like to. 1 cup okra - optional. Frozen or fresh, sliced or whole. Salt and pepper to taste - okay to leave out salt if you are adding Cajun spices, as they will be salty enough. Rice (1/2 cup of uncooked rice equals one serving) - Cook with 2 cups rice to use up all the Gumbo. You can use white or brown rice. Follow package directions. Start water to boil in a large enough pot to hold 4 quarts of water. Add cut-up chicken. 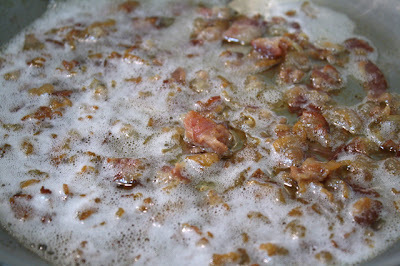 Add 1/2 cup of oil to large fry pan over medium heat, and brown sliced sausage, about 10 minutes. Remove from oil with slotted spoon and drain, or add directly, to boiling chicken. Next, stir in chopped veggies to frying pan with oil. Saute for about 5 minutes until soft. Again, remove cooked veggies with a slotted spoon and add to boiling chicken and sausage pot. Try to remove all veggie bits, because next, you are browning flour in the oil for 20 minutes! 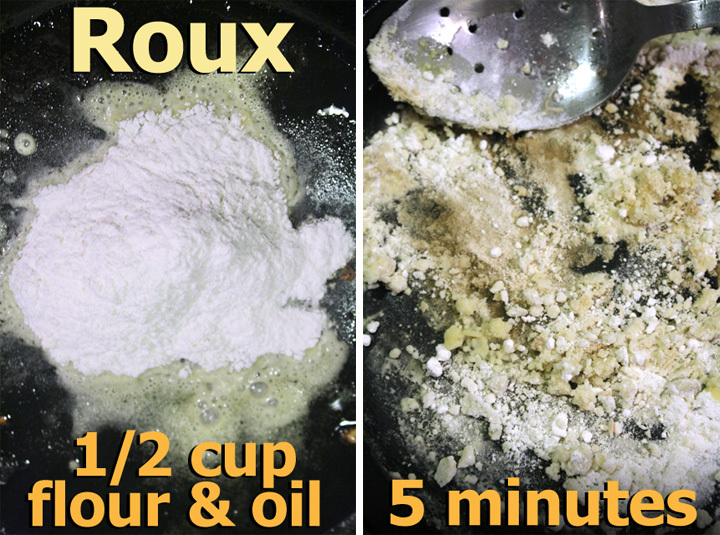 Add flour to oil to make a Roux. Make sure you have your favorite radio station playing in the background -- you need to slowly stir the flour and oil until it is a dark brown, about 20 minutes. This gives Gumbo its brown color and nutty flavor. 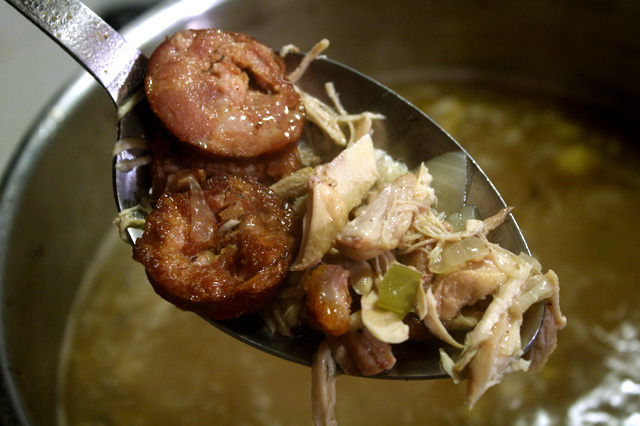 A lighter Gumbo can be made using less oil. Just use a tablespoon of oil to fry sausage and veggies. And flour will brown without oil as well -- just slowly stir flour around and watch it change color. Also, try using healthier flours, like whole wheat. 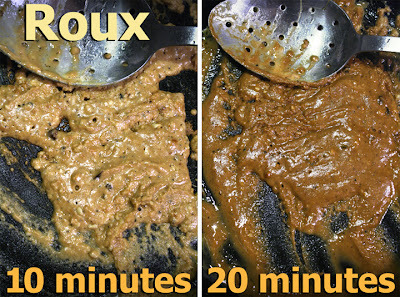 When Roux is done, turn off heat and let it cool for a couple of minutes, so oil doesn't splatter when you add it to the Gumbo pot. 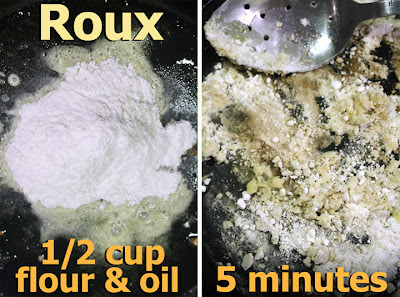 Carefully add Roux to boiling meat and veggies. 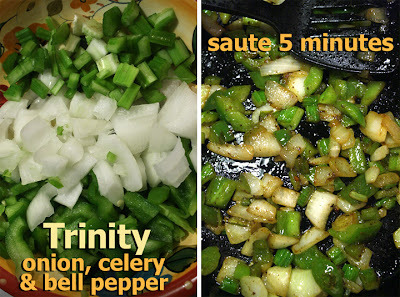 Add okra and also add teaspoon of dried File (both optional.) Stir well. 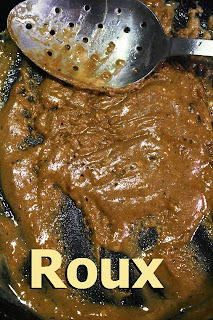 You can add some of the broth back to the Roux pan to wash it all out. By now, the meat, sausage and veggies have been cooking for about 1/2 hour. At this point, bring Gumbo to a boil, reduce heat to a low simmer, cover and cook another hour. I usually uncover after half an hour to make the Gumbo broth cook down by about half. This makes for a richer broth. You can always add water, or broth, if you lose too much liquid. During the last half hour of cooking, you can start your rice. Cook according to package directions. 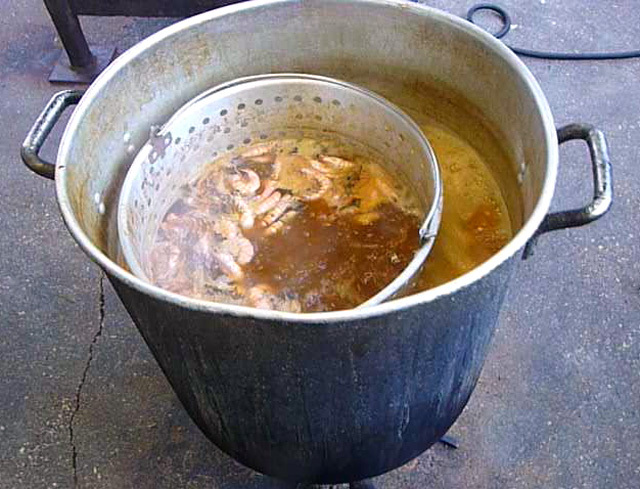 To impress your guests and make your gumbo look like the picture above, remove bones and shred chicken into bite-size pieces. Return chicken to Gumbo to reheat before serving. Finally, during the last 15 minutes, add chopped green onions and parsley. Serve Mom's Chicken and Sausage Gumbo over white or brown rice.